Citation: Manimozhi,V. Nandhakumar,G. Kumaresan,A. (2013). 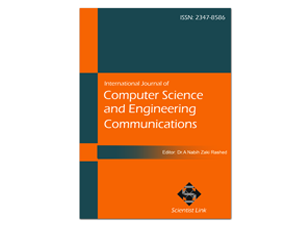 Security Defence Decision in Mobile Ad hoc networks International Journal of Computer Science and Engineering Communications,Vol.3,Issue.2,pp.670-675. Index Terms:Network security, MANET, Nash Equilibrium, Proactive table, Intrusion detection system. Mobile Ad Hoc Networks has one of the prevalent areas of research in recent years. It is the new emerging technology which makes users to communicate without any physical infrastructure. MANET is sometimes referred to as an infrastructure less network. An ad-hoc network is self –organizing and adaptive device in mobile ad-hoc networks. It operate in highly dynamic, infrastructure-less and potentially hostile environments, with limited bandwidth and energy resources. Even though security has long been an active research in wire-line networks, the unique characteristics of MANETs gives a set of no trifling challenges to security design. A wireless mobile node can function both as a network router for routing packets from the other nodes and as a network host for transmitting and receiving data. Network topology changes dynamically and unpredictability because of nodes mobility. On the other hand, the unique characteristics of MANET allow new challenges to security design due to lack of any central authority and shared wireless medium. Two complementary classes of approaches exist to protect high security MANETs, prevention-based approaches, such as authentication, and detection-based approaches such as intrusion detection. Continuous authentication and intrusion detection can be considered to improve the performance of high security MANETs. Therefore combining continuous user authentication and intrusion detection can be an effective approach to improve the security performance in high security MANETs. Recently, game theoretic approaches have been proposed to improve network security in IDS. Game theory is a tool to solve multiple-player games. It describes a game by specifying the players involved in the game, in order to which the player take actions, knowledge of the previous actions taken by another player. In game theory assumes each player is rational; this means that each player aims to choose the response that brings the greatest benefit. A Game includes the interactions between nodes in any situation. In mean field game theoretic approach denotes the cooperative, if nodes interact cooperatively. Game theory is used to model the interaction between the defender and attacker. It used to determine which access control strategy is the best for access control system. In this paper is based on security defense decision in mobile ad hoc networks with the help of Nash Equilibrium (NE) algorithm, to detect the neighbor node is attacker or not and proactive scheme is used to generate our shortest distance path between the one node and other in networks. Packets are widely transferring through the clustering of nodes in (MANETS) based on the individual host address in router. According to this search to prevent multiple attackers in networks and their packets are securely transferred from one node to other. Q. Guan, F. R. Yu, S. Jiang, and V. Leung, “Joint topology control and authentication design in mobile ad hoc networks with cooperative communications,” IEEE Trans. Veh Technol., vol. 61, no. 6, pp. 2674–2685, July 2012. H. Yang, H. Luo, F. Ye, S. Lu, and L. Zhang, “Security in mobile ad hoc networks: challenges and solutions,” IEEE Trans. Wireless Commun., vol. 11, pp. 38–47, Feb. 2004. J. Liu, F. R. Yu, C.-H. Lung, and H. Tang, “Optimal combined intrusion detection and biometric-based continuous authentication in high security mobile ad hoc networks,” IEEE Trans. Wireless Commun., vol. 8, no. 2,.pp. 806–815, Feb. 2009. Y. Zhang and W. Lee, “Intrusion detection in wireless ad hoc networks,” in Proc. 2000 ACM MOBICOM, pp. 275–283. X. Liang and Y. Xiao, “Game theory for network security,” IEEE Commun. Surveys Tuts., vol. 15, no. 1, pp. 472–486, 2013. F. Li, Y. Yang, and J. Wu, “Attack and flee: game-theory-based analysis on interactions among nodes in MANETs,” IEEE Trans. Syst., Man, Cybern. (B), vol. 40, pp. 612–622, June 2010. Yanwei Wang, F. Richard Yu, Senior Member,” A Mean Field Game Theoretic Approach for Security Enhancements in Mobile Ad hoc Networks,” IEEE Transactions on Wireless Communications, Vol. 13, no. 3, pp. 612-622,March 2014.